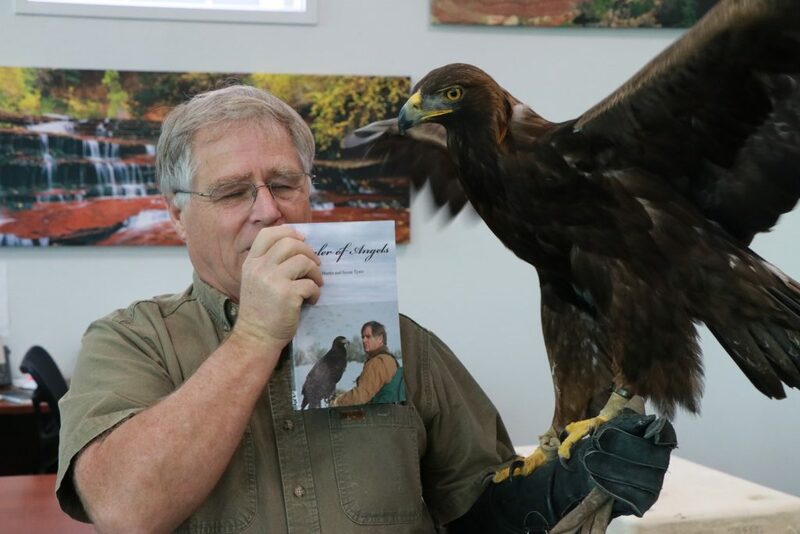 SOUTHERN UTAH — Martin Tyner says his lifelong love for birds and animals began at age 12, when he and a neighbor found a baby owl that had fallen from its nest. 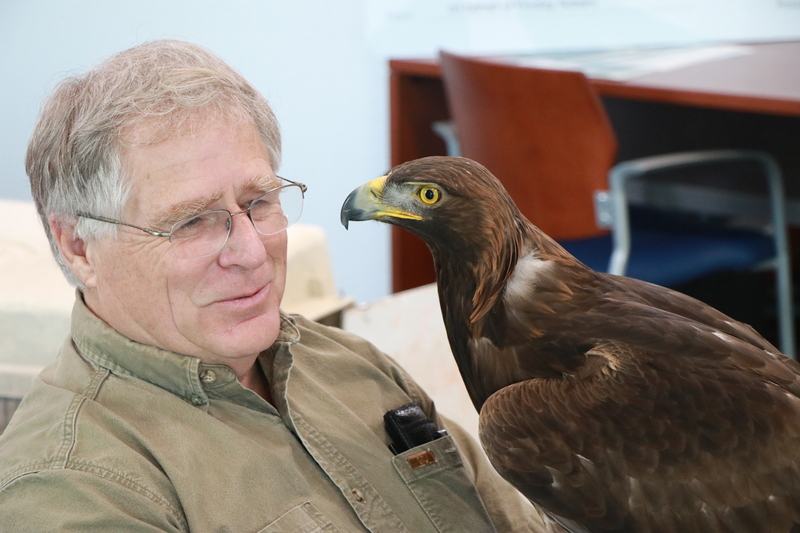 Since that childhood moment, Tyner says he hasn’t stopped helping care for birds and animals. “My parents told me to stop playing with birds and do something with my life. 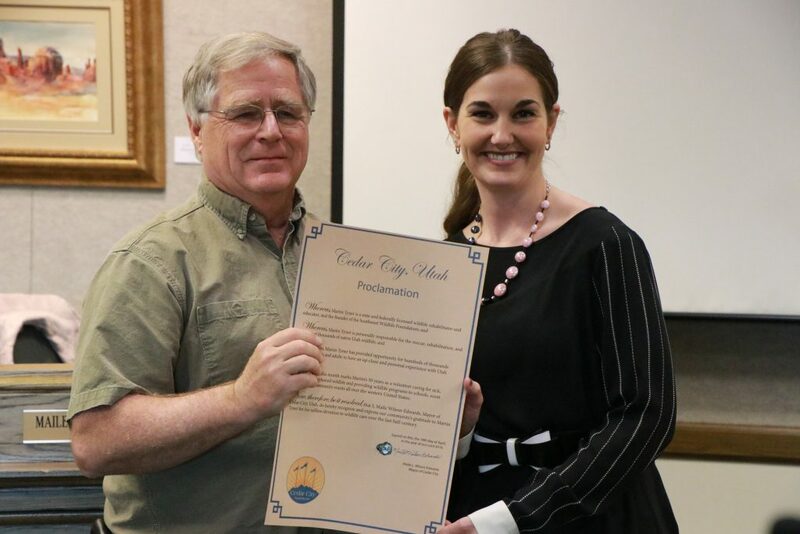 Well, this is what I’ve done with my life,” Tyner said during Wednesday’s Cedar City Council meeting where he was recognized by Mayor Maile Wilson-Edwards and the council members for his five decades of service as a volunteer wildlife rehabilitator and volunteer wildlife and environmental educator. 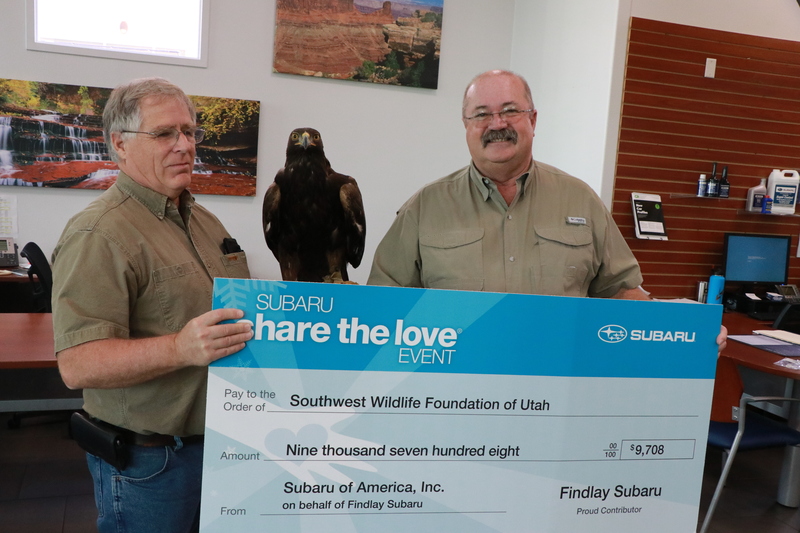 Two days later, on Friday, Tyner and his wife Susan visited the Findlay Subaru automobile dealership in St. George to receive a check for more than $9,700 on behalf of the Southwest Wildlife Foundation of Utah. 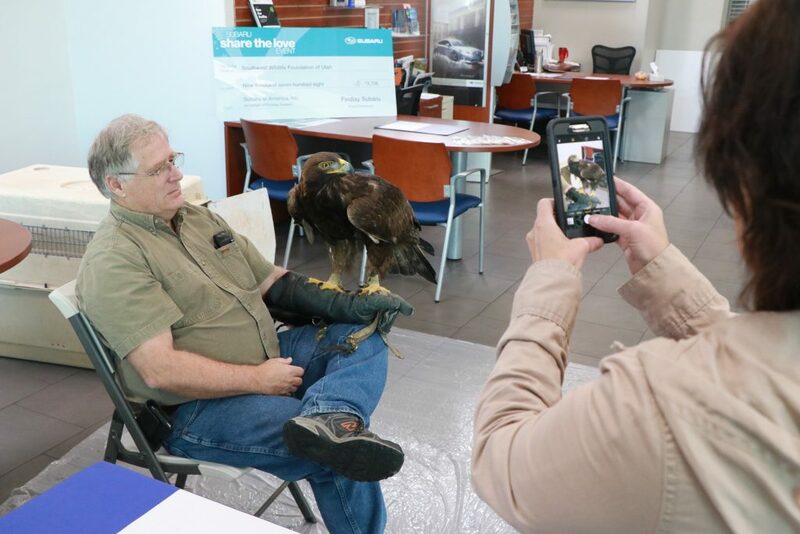 Dave Gourley, Subaru general manager, said this year marks the fifth straight year the dealership has presented a check to the Southwest Wildlife Foundation, co-founded and operated by the Tyners. The total amount of donations to date over the past five years is more than $32,000, Susan Tyner said, noting that this year’s contribution of $9,708 is the largest yet. 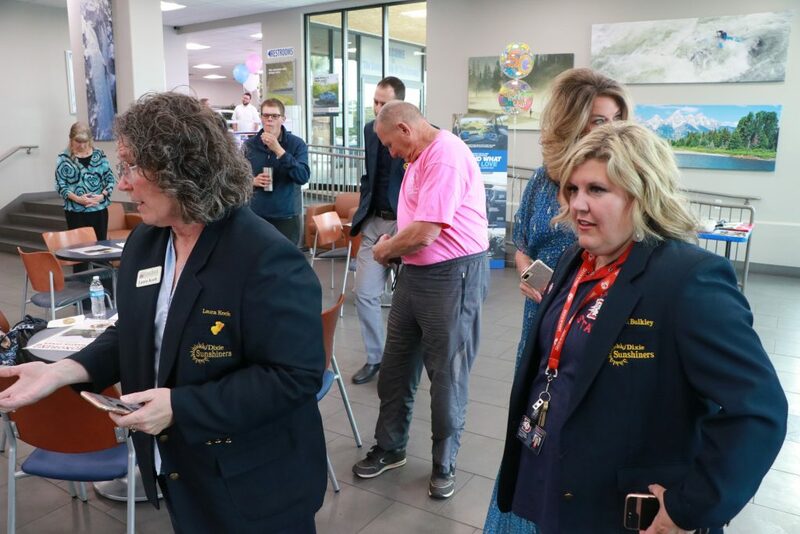 Gourley said the funds were generated through vehicle sales at the dealership in November and December, with matching funds provided by the Subaru America as part of its popular “Share the Love” campaign. 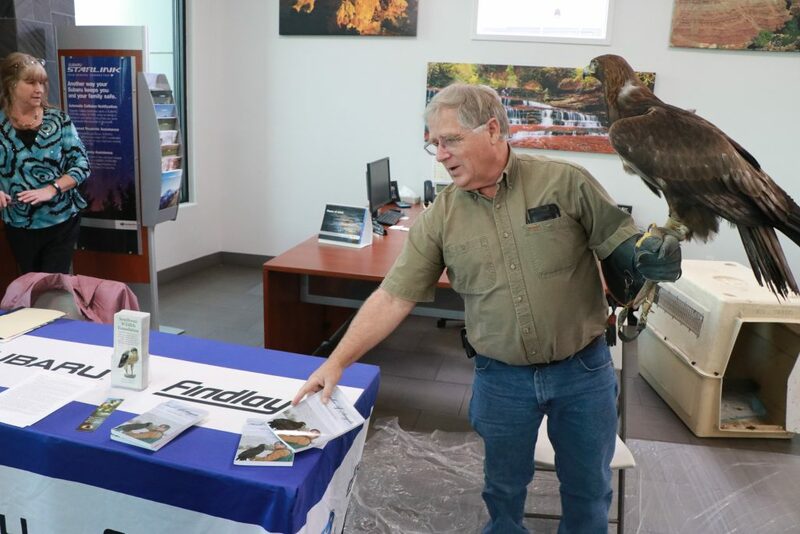 At the Findlay Subaru event, Martin Tyner was accompanied by his avian sidekick Scout, an 18-year-old golden eagle. The bird is so named because he and Martin Tyner frequently make appearances at Boy Scout courts of honor, when awards and rank advancements are presented. They also often visit school groups and other organizations and appear at other public events, including lectures, outreach programs and educational demonstrations. 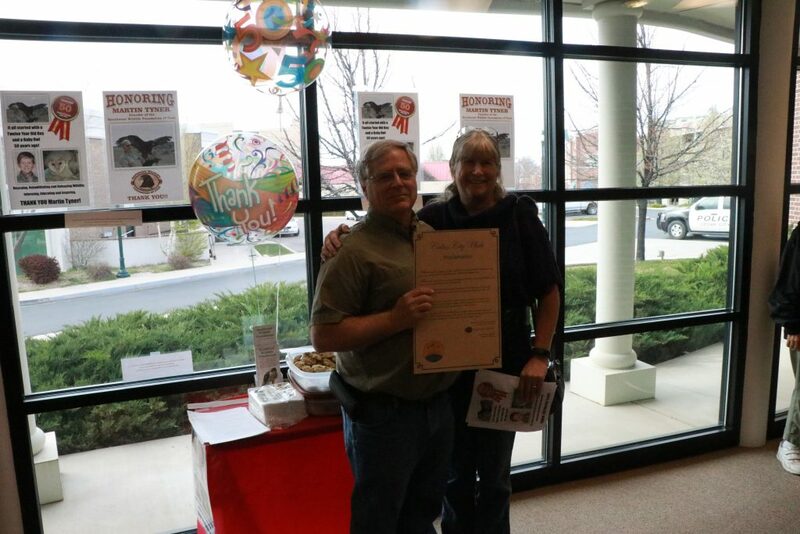 After Friday’s check presentation, Susan Tyner read aloud a letter from Utah Gov. Gary Herbert thanking Martin Tyner for his service. “Utahns like you help to make our state such a great place to live,” the governor wrote. 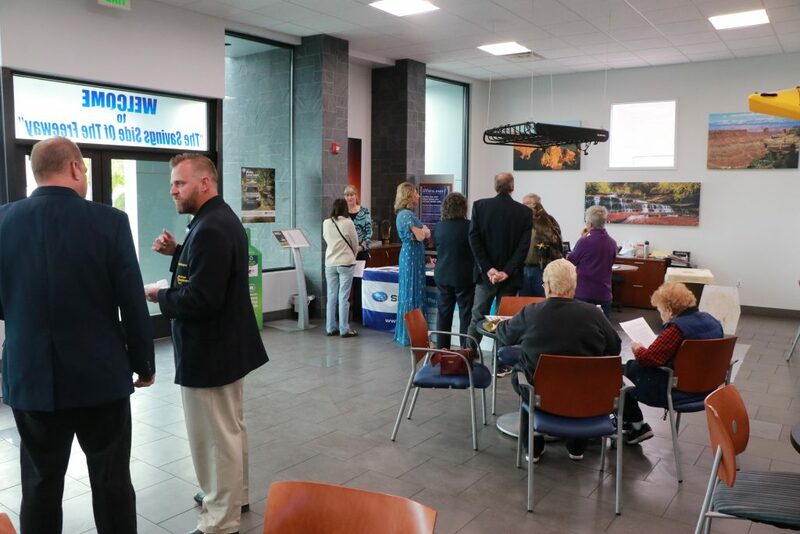 About two dozen people attended Friday’s presentation at Findlay Subaru, including members of the Dixie Sunshiners group from the St. George Area Chamber of Commerce. 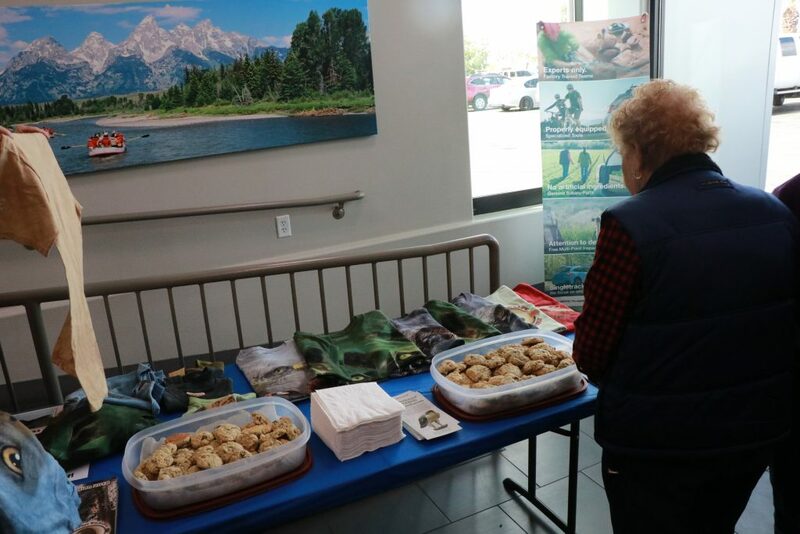 Following the presentation, those in the audience helped themselves to oatmeal chocolate-chip cookies made using Martin Tyner’s grandmother’s recipe. A few also purchased copies of the Tyners’ autobiographical book, “Healer of Angels,” with proceeds going to the foundation. 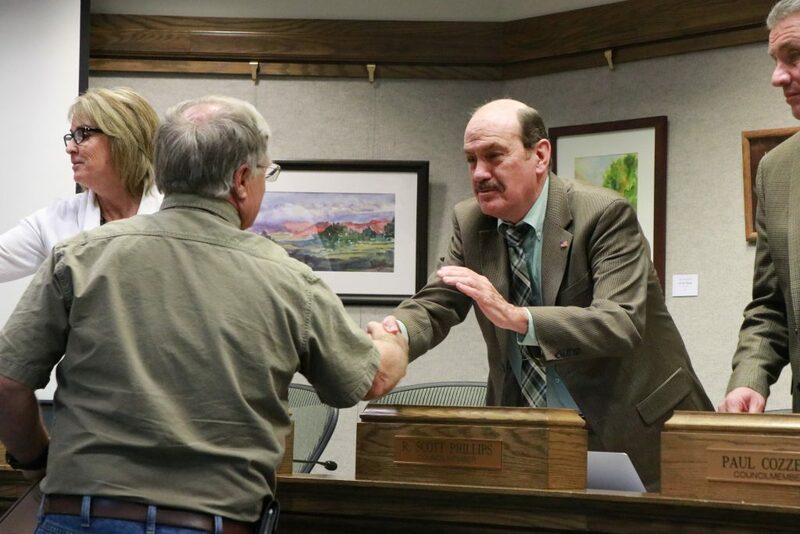 Martin Tyner said the recently donated funds will be put to good use right away, as he and Susan are currently working on improvement projects for the facilities at Cedar Canyon Nature Park, including converting a donated trailer into a visitor center. Southwest Wildlife Foundation of Utah website. “Healer of Angels” book available on Amazon. How Findlay Subaru supports local organizations.